Endre (Géza Morcsányi) is the chief financial officer of a Hungarian abattoir. He has a disability – his left arm permanently hangs limp by his side. He has a sad, haunted quality. He meets the abattoir’s new quality inspector Mária (Alexandra Borbély), a quiet and withdrawn woman with behaviour that places her someplace along the autism spectrum. There is a connection, and possibly a romance, but mostly there is just awkwardness. On Body and Soul does not begin with Endre and Mária. It begins with a remarkable scene of two deer in a forest. It was not until I saw the scene that I realised just how accustomed I am to deer getting shot in films. The scene is weirdly tense, because there is an innate concern that one or both of the animals is about to get shot. That it cuts to frank and unflinching scenes inside an abattoir only enhances that tension. The deer seem a weird, almost absurdly pretentious touch, until Endre and Mária both undergo workplace psych evaluations and discover that they have been sharing the same dream. They are the deer. 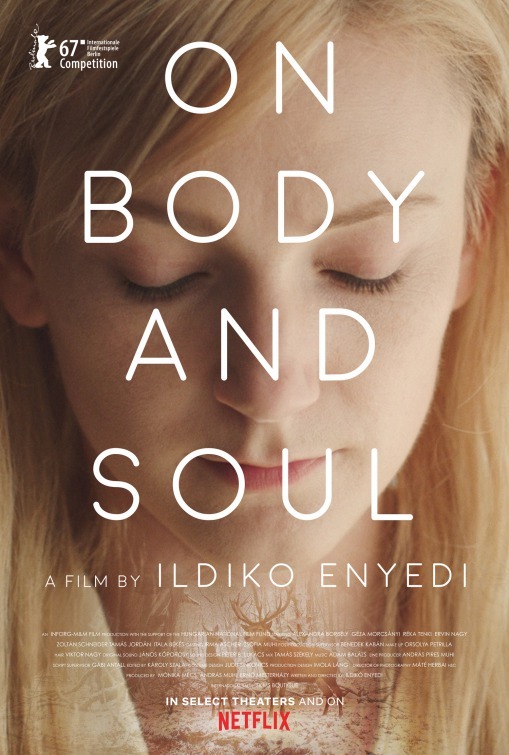 On Body and Soul is a remarkable film drama by writer/director Ildikó Enyedi. Its premise is ridiculous, and yet Enyedi treats with great delicacy and care. She develops two distinctive, idiosyncratic protagonists and then spins a story out of their difficult and uncertain relationship. Both are performed to a kind of perfection: the screenplay does not provide the kind of back story to which many viewers may expect, and much of the heavy lifting is left to Morcsányi and Borbély’s acting. Things in the past have obviously affected both characters very deeply; what they are is left a mystery, and the genius of Enyedi’s writing and direction is that she realises the viewer does not need that information to reach the emotional heart of the story. Despite its magical realism set-up, this is a very small and realistic movie. It has so much emotional depth to it. Technically it is superb. Cinematographer Máté Herbai turns every shot into a beautifully composed painting. The film’s use of colour is superb. The scenes of the two deer are remarkable to watch, and capture the animals in such an emotive fashion. A small range of supporting characters add depth and a little complexity. Particularly interesting is Ervin Nagy as Sanyi, a tall and muscular young man who enters the film early on and immediately causes ripples in the abattoir’s comfortable routine. He seems to set up a string of familiar plot threads: a potential suitor to Mária, or an enemy for Endre. Enyedi never makes a stereotypical choice, and the film is so much stronger for it. The film comes to Australian cinemas after being showered with awards: the Golden Bear at the Berlin Film Festival, a European Film Award for Alexandra Borbély, and even an Academy Award Best Foreign Language Film nomination. It’s got them because it deserves them. Films this distinctive and heartfelt do not come along very often. On Body and Soul is a small, soulful masterpiece.